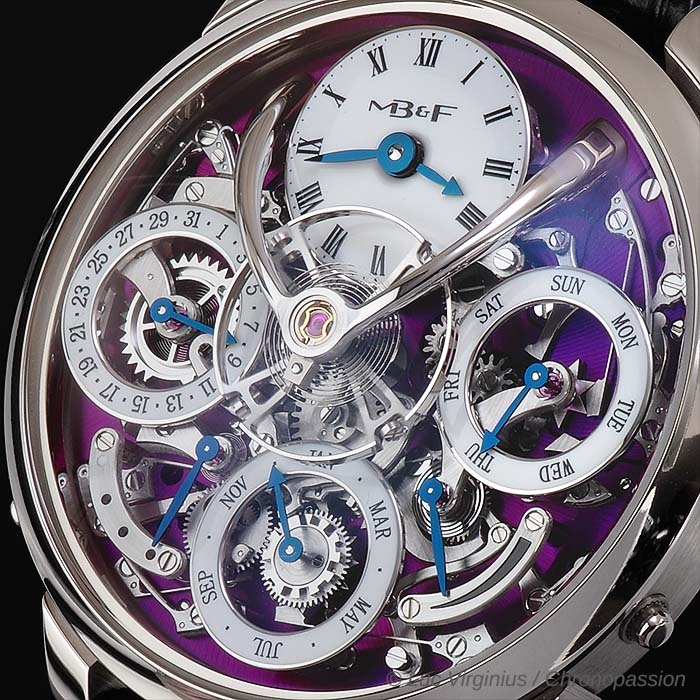 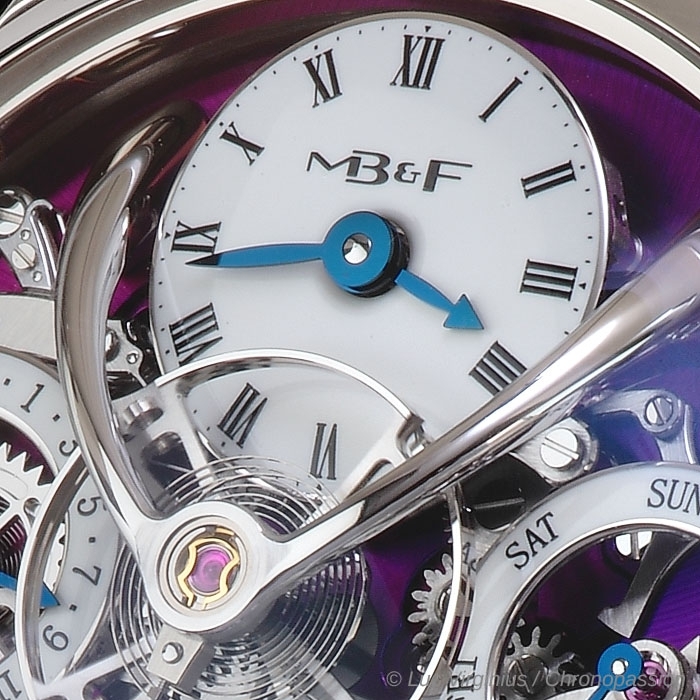 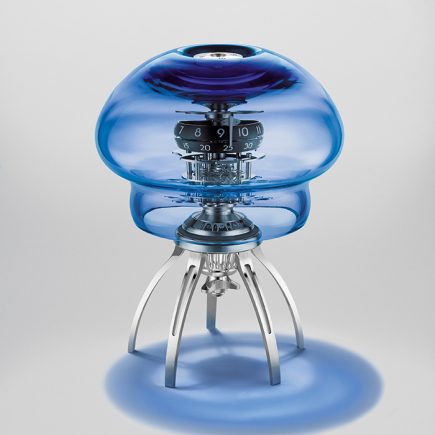 MB&F | 164'400 € Tax inc.
First launched in 2015 in red gold and platinum editions, the LM Perpetual is now also available in two white gold editions: a limited edition with purple face, and a non-limited edition with grey face. 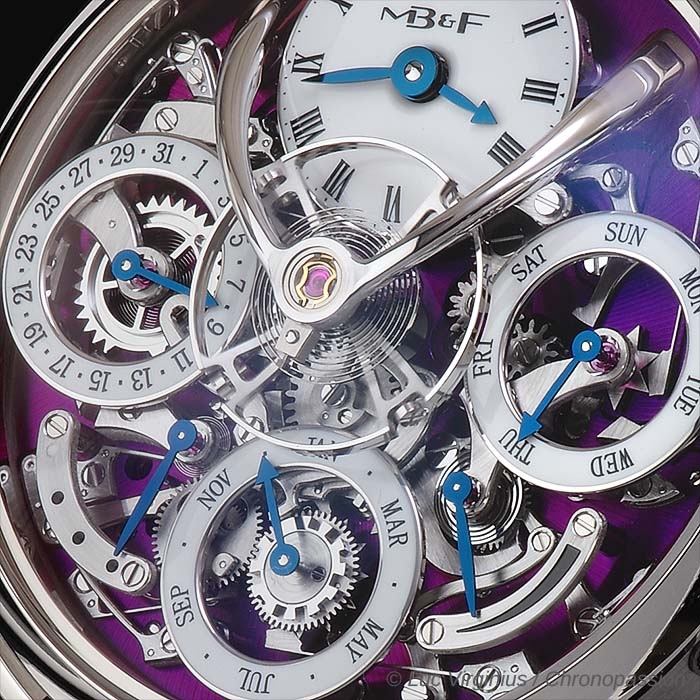 The fact that the new complication looks sensational and can be fully appreciated dial-side is just one of the many bene ts offered by the new movement, controlled by a mechanical processor (patent pending). 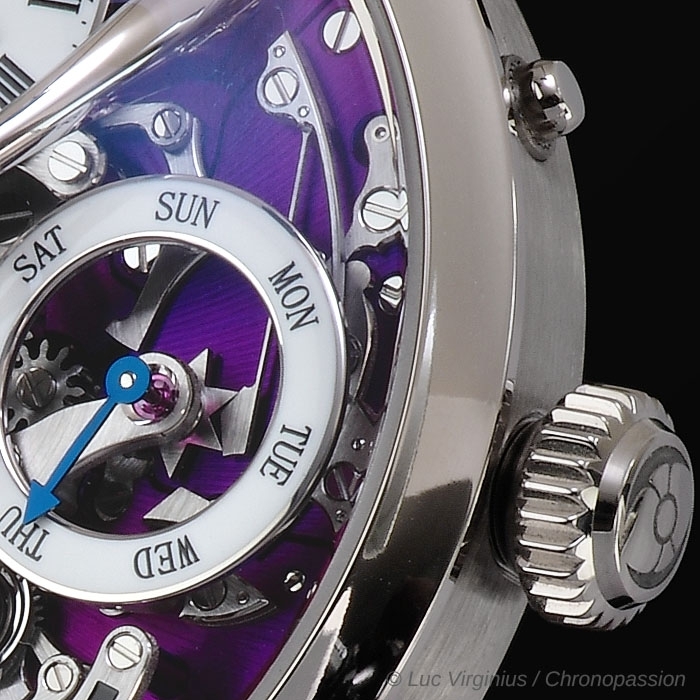 The perpetual calendar is one of the great traditional com- plications, calculating the apparently random complexity of the varying numbers of days in each month − including the 29 days in February during leap years. 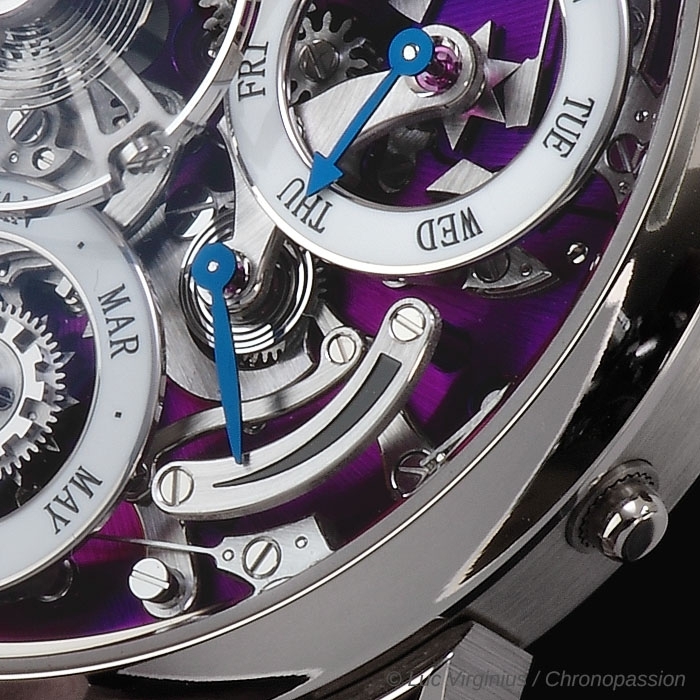 But traditional perpetual calendars do have a few drawbacks: dates can skip; they are relatively easy to damage if adjusted while the date is changing; and the complications are usually compromises of modules powered by base movements. 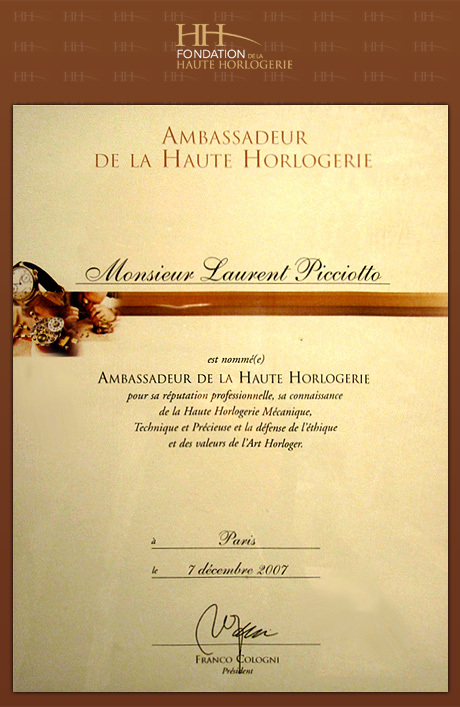 the redundant dates during changeover. 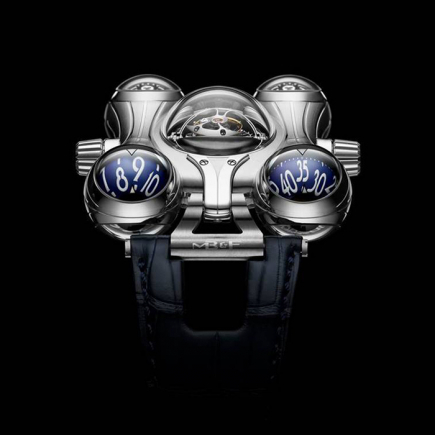 A traditional perpetual calendar changing from February 28 to March 1 scrolls quickly through the 29th, 30th and 31st to arrive at the 1st. 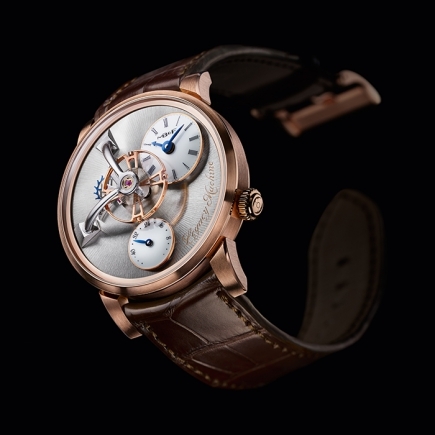 With its open dial revealing the full complication and sus- pended balance, it’s the harmonious mechanical beauty of LM Perpetual that really steals the show. 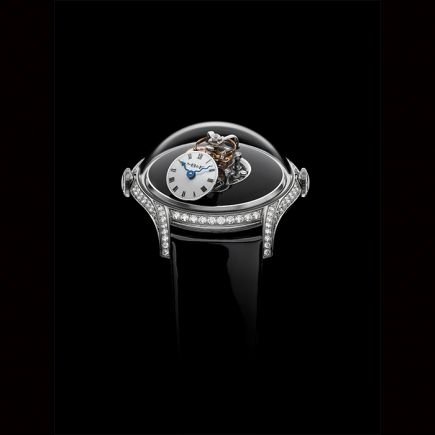 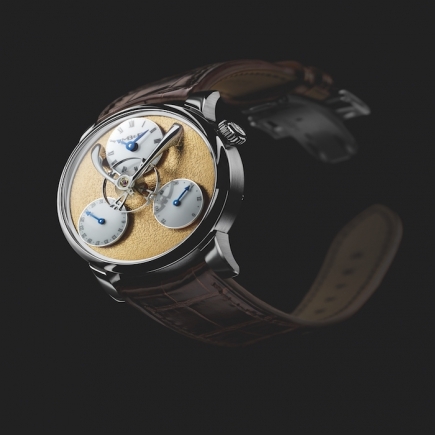 And in an interest- ing technical twist, that eye-catching balance hovering on high is connected to the escapement on the back of the movement by what is likely to be the world’s longest balance staff. 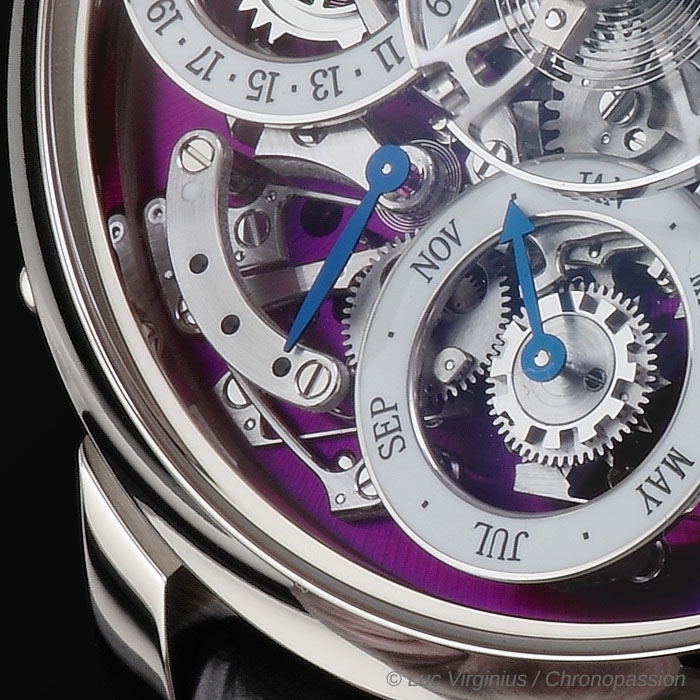 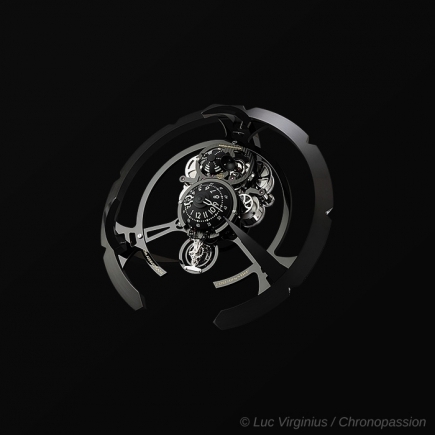 Using an innovative system developed especially for Legacy Machine Perpetual, the subdials appear to “ float” above the movement with no visible attachments. 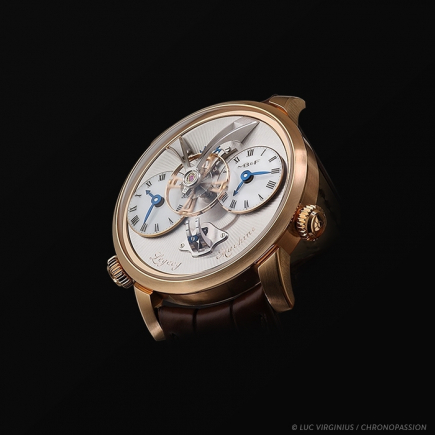 The skeletonised subdials rest on hidden studs, which is technically impossible with traditional perpetual calendar mechanisms because they would block the movement of the grand levier. 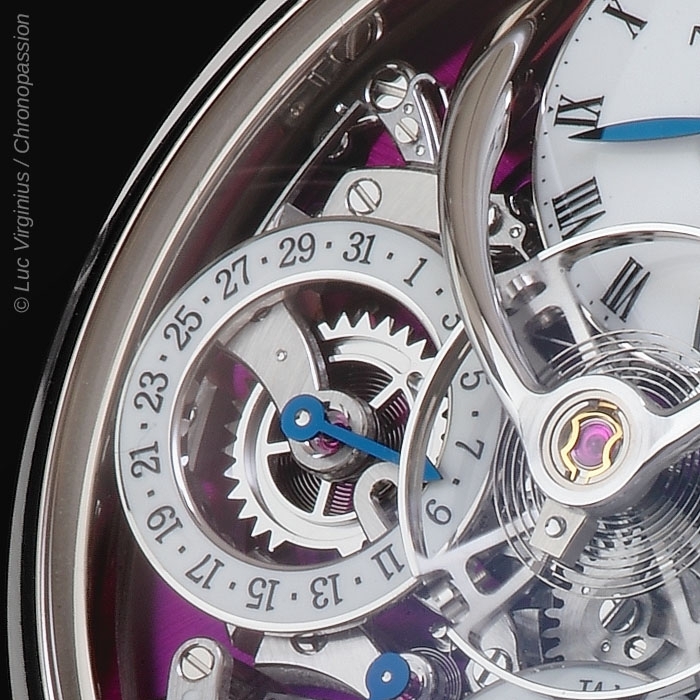 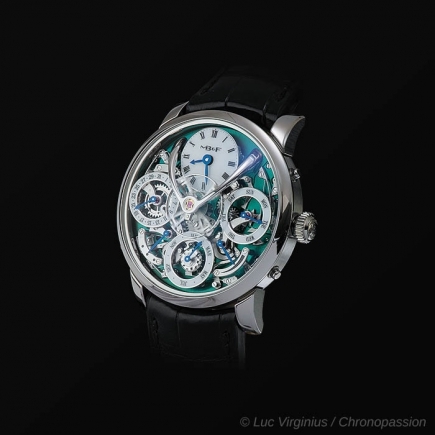 LM Perpetual: complexity simplifed with integrity and beauty. 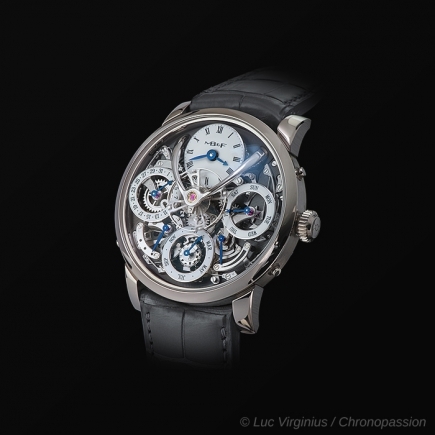 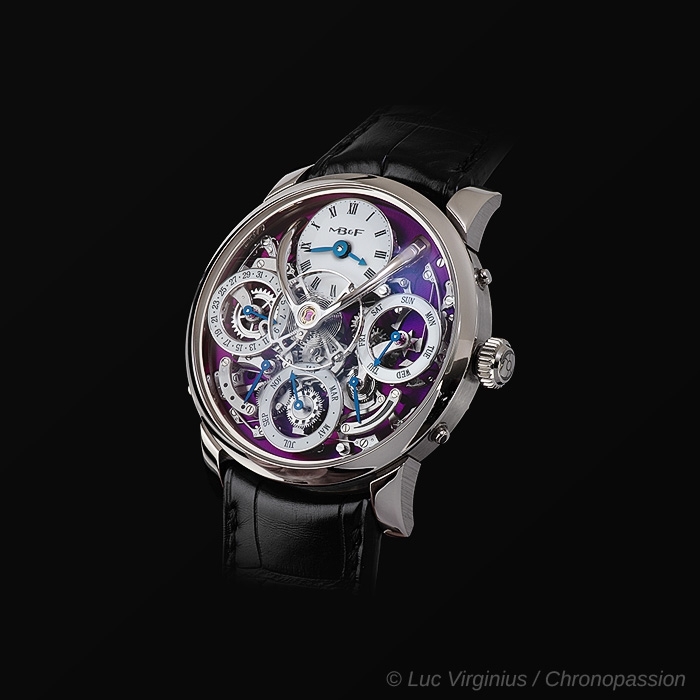 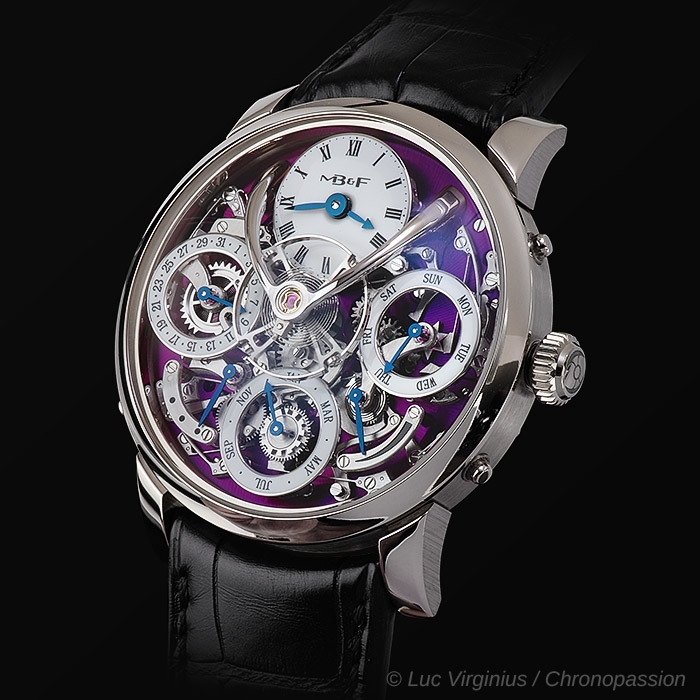 Legacy Machine Perpetual is available in three limited editions of 25 pieces each in platinum 950 (blue face), 18k red gold (grey face) and 18k white gold (purple face); and in a non-limited edition in 18k white gold with grey face. 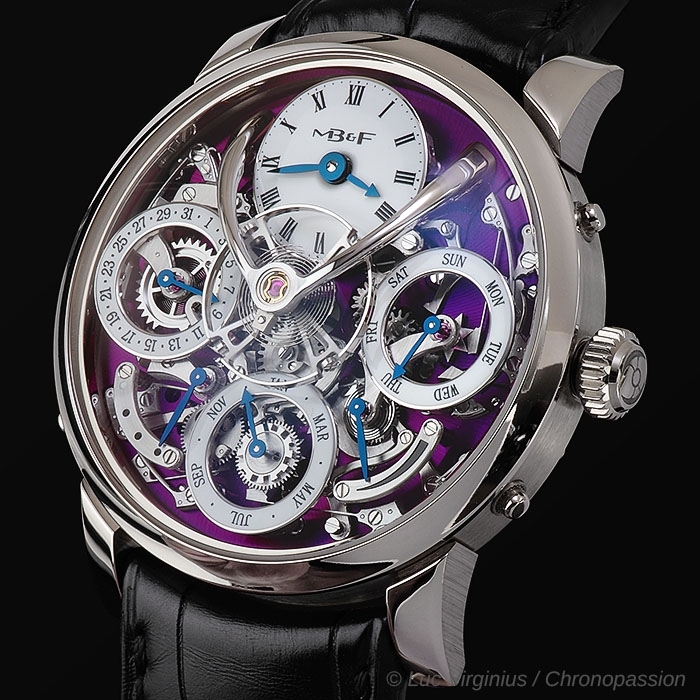 3 limited editions of 25 pieces each in platinum 950 (blue face), 18k red gold (grey face) and 18k white gold (purple face); and a non-limited edition in 18k white gold (grey face). 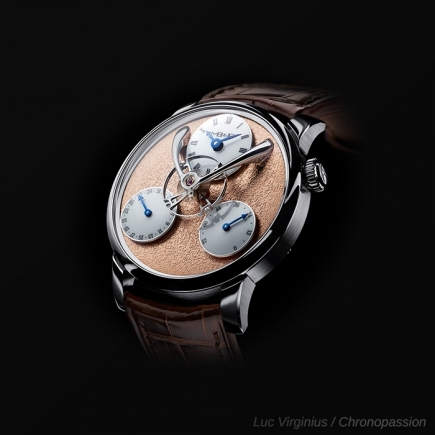 Black, grey or dark brown hand-stitched alligator strap with gold / platinum folding buckle matching case material.